If you’re of a certain age and, in your youth, were used to frequenting amusement arcades in seaside towns then you’ll be quite familiar with the Derby Day-type games. You would put some money in the slot, pick the horse of your choice and then watch as small metal jockeys and horses made their way around the track, usually resulting in disappointment for you. Derby Day Horse Racing from Playtech could be described as the descendant of those mechanical games but it’s fair to say it’s 100x better and you don’t ned to leave the house to play it. Betting options are wide and varied compared to the win or bust type of wager on the old style game. 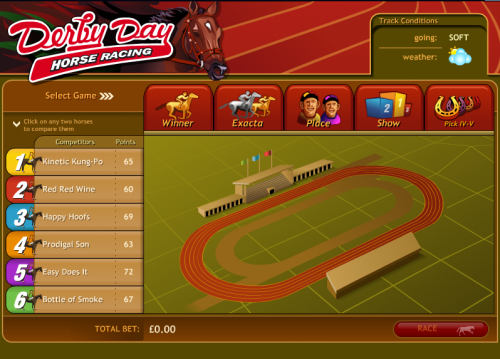 When the game boots up you will be faced with a list of six runners down the left hand side of the screen, each with a points value attached; click on a horse and you’ll be presented with a form card, giving you lots of information about age, recent results and such like as you can see below. In this fashion, two horses can be compared side by side. There’s also a weather forecast above the betting options which displays track conditions. As the punter you can only choose one of the above bets but when choosing ‘Place’ or ‘Show’ you can bet on more than one horse. Once you’ve placed all your bets just sit back and watch as the race unfolds before your eyes; the horses will jockey for position with one winning eventually. There’s no doubt that all the information in Derby Day can make everything a little complex but if you just want to have a simple punt on a winner, you can do that as well. Stakes can vary from £0.20 to £100 so there’s something for everyone’s budget.